The streets of New York have been plagued by a pattern of crimes too weird and bizarre for the average detective. Lurking in the evidence are shadows of loathsome horrors from beyond space and time, seeking to usher in the unimaginable evil of the Old Ones. And the only man capable of fighting against the unspeakable terrors isn't a man at all. Detective Sebastian Green is one of them--it takes a monster to catch a monster. 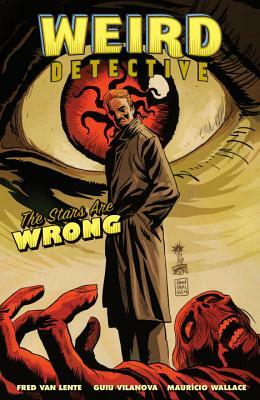 New York Time's best-selling author, Fred Van Lente, and artist Guiu Vilanova are on the case for Weird Detective, a Lovecraftian mystery tale! Fred Van Lente is the New York Times #1 best-selling author of Marvel Zombies, Incredible Hercules (with Greg Pak), Odd Is On Our Side (with Dean R. Koontz), as well as the American Library Association award-winning Action Philosophers. His original graphic novel Cowboys & Aliens (co-written with Andrew Foley) is the basis for the major motion picture starring Daniel Craig and Harrison Ford. Van Lente's other comics include The Comic Book History of Comics, Taskmaster, Archer & Armstrong, Amazing Spider-Man, and GI Joe. The author lives in Brooklyn, NY.